Masquerade – Australia’s freshest corporate cover band – is set to shake things up! Fun, energetic and with a passion for delivering the hottest live show in town. 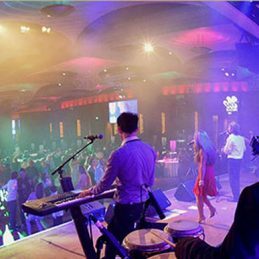 Masquerade truly stands out in a league of their own as one of Australia’s Premier corporate cover bands. Combining the talents of Australia’s most sought-after musicians, its members boast global experience, having performed worldwide and in support of a massive range of internationally acclaimed artists. Masquerade is quality musicianship at its finest, fronted by the charismatic one-two punch of Andy Grant and Olivia Cervasio on vocals. Think MJ, Eurythmics, Queen and Madonna. Add everything through to Beyoncé, Lady Gaga and the Blackeyed Peas – and you’re in for just a small taste of the energy these guys can provide at your next event. Masquerade turn up the heat with classic dance floor hits of the ‘70s, ‘80s and ‘90s as well as an ever-expanding list of today’s hottest hits. Looking for that something special that only live background music can provide at your function? Look no further – Masquerade value the importance of background music and truly understand what it takes to deliver the right amount of ambience to any event. From weddings to corporate award shows Masquerade’s versatility in band line-up and song choice will help break the ice and create a memorable talking point for your guests. Masquerade have performed for some of Australia’s biggest corporate names : Westpac, Toyota, Greyhound racing Association, Australian Chinese Association, Australian grains industry to name a few and share a professional working partnership with many of Australia’s exclusive entertainment venues (Crown Casino, Docklands, AAMI Park stadium, Etihad stadium, Park Hyatt, Melbourne Aquarium and the Melbourne Convention centre). Make no mistake – Masquerade sets new heights in the Australian corporate entertainment scene and one in which we would be delighted to share with you at your next event.